We have distilled our 8 years of project work, followed by 4 years of publishing effort, so that you, the reader, can grasp what we did and found in just 24 minutes - enjoy! This was a unique project firstly because it was led by livestock producers - and that is quite rare in agricultural research. It was conducted on the Northern Tablelands of NSW. At the first meeting, a group of leading producers agreed that there was a widening gap between practising farmers and the research and extension community. So, a proposal was put forward to the Wool Corporation to fund an initial survey to find out what issues farmers wanted investigated and to ask the farmers if they would be interested in joining a project to be led by farmers to try to bridge the gap - they were interested! Initial funding support was provided by the Wool Corporation to create a new learning partnership between producers, researchers and extension specialists and carry out applied investigations into the most important problems chosen by the farmers that were relevant to improving the profitability and sustainability of grazing enterprises in the region. We called it the 'Cicerone Project' as we wanted there to be learning by all participants. The Cicerone Project Board wanted all research to be both of practical use to farmers and also for it to be scientifically valid. It chose as its motto: 'compare-measure-learn-adopt'. 2 What were farmers' most important problems? The survey of more than 300 farmers found out what farmers' most serious problems were: challenges of dry seasons, fertiliser use, pasture composition and pasture persistence. In addition, control of internal parasites of sheep was important. A decision was made to investigate management systems that might improve the productivity, resilience, stability and longevity of pastures and the effects of grazing management on both pastures and internal parasite control. Asking farmers what their most important farm management problems were, allowed more focused research and extension programs to be undertaken by the Cicerone Project and ensured that farmers were interested in the findings. At a special meeting organised by Cicerone, livestock producers stated that there was an anomaly in the testing regime for virulent footrot. The Cicerone Project agreed to investigate. After two carefully conducted field trials and with associated DNA testing, the concern of the producers was found to be correct. The footrot studies were undertaken in both the Northern and Central Tablelands of NSW. Practical observations from producers, followed by producer support for trial work, which was then undertaken in a scientifically rigorous manner, showed the value of producer/research partnerships in bringing about outcomes of great benefit to the livestock industry. The new testing regime developed has had broad application across Australia. This paper describes a novel approach to plan the allocation of land to three unreplicated whole-farm management systems such that each 50 ha farmlet had equivalent starting conditions and yet was at a scale credible to both livestock producers and researchers. The paddocks of each farmlet were distributed across the landscape in a ‘patchwork quilt’ pattern after six iterations of a mapping exercise using a Geographic Information System. Allocation of paddocks took into account those variables of the landscape and natural resource capacity that were not able to be altered. An important benefit of the procedure was that it ensured that the farmlets were co-located with contiguous paddock boundaries so that all farmlets experienced the same climatic as well as biophysical conditions - this was essential for valid comparisons to be made. The farmlets were designed to compare a typical farmlet (B) as the control with a second farmlet (A), which received higher levels of pasture renovation and soil fertility, and a third farmlet (C), which employed intensive rotational grazing management with short graze and long rest periods. Management guidelines were developed for all soil, pasture, livestock and grazing management decisions on the three farmlets. Whole-farmlet data are presented for the pastures sown, fertiliser applied, supplement fed, the stocking rates attained and the pattern of graze and rest periods over the experimental period from July 2000 to December 2006. Over the first 4 years of the trial, pastures were renovated on 71% of farmlet A while 8% of each of farmlets B and C were renovated. The experiment was planned so that the farmlets were allocated to matched paddocks on the basis of background variables such as soil type, elevation and slope, that were measured across each paddock before the start of the experiment. These variables were used in the statistical model so that farmlet effects could be separated from the changes in responses to treatment over time. Two datasets on botanical composition and hogget liveweights are analysed in the paper as examples. Inferences from the experiment are guarded because we acknowledge that the use of conditioning variables and matched paddocks does not provide the same power as replication. Nevertheless, we conclude that the differences observed are more likely to have been due to treatment effects than to random variation or bias. Soil tests over 5 years indicated that only nitrogen (N), phosphorus (P) and sulfur (S) varied with time within the farmlets while the other indices of soil fertility remained similar. Phosphorus and sulfur levels increased in response to fertiliser applications whereas N levels responded to increases in legume composition, which was stimulated by the higher P and S levels. Farmlet productivity was driven by P and S fertility and thus the two farmlets with lower P and S fertility (farmlets B and C) had similar but lower levels of farmlet productivity compared with farmlet A. Significant increases in several measured pasture productivity parameters were observed in response to the higher P and S fertility on farmlet A, especially when climatic conditions were favourable. The results confirm the findings of earlier research on the Northern Tablelands, and elsewhere in the high rainfall zone, that has demonstrated that higher soil fertility levels and pasture renovation enhance the productivity of grazing enterprises more than grazing management, without imposing significant risks to the environment. Over the experimental period, both rainfall and available soil water were mostly significantly below the expected conditions for this region and so the results need to be viewed with this in mind. Also, there was an increased frequency of severe frosting during the dry winters experienced over the 6.5-year period. These dry and cold conditions were likely to have limited the responses to the pasture and grazing management treatments imposed on the three farmlets. Lower than average levels of available soil water were likely to have constrained pasture production, threatened pasture persistence, and reduced the response of the pasture to available soil nutrients and, as a consequence, livestock production and economic outcomes. Eight assessments of botanical composition were carried out at approximately annual intervals across each of the 37 major paddocks distributed across the farmlets and the results for each of 49 species were aggregated into seven functional groups for analysis. The strongest correlation found was a negative relationship between sown perennial grasses (SPG) and warm-season grasses (WSG). That is, as SPG go up, WSG decline. The most significant factors affecting the functional group changes were soil P, sowing phase, paddock and date. We observed significant increases in SPG and correspondingly lower levels of WSG on Farmlet A compared with Farmlet B.
Farmlets B and C experienced similar, declining levels of SPG, and increasing levels of WSG suggesting that intensive rotational grazing did not lead to substantial changes in botanical composition, compared with flexible rotational grazing, in spite of the fact that intensive rotational grazing had much longer grazing rests and shorter graze periods than the other two farmlets. Although the climate was generally drier than average, the differences between farmlets in pasture herbage mass and quality became more evident over the duration of the experiment. After the farmlet treatments started to take effect, the levels of total and dead herbage mass became significantly lower on farmlet A compared with farmlets B and C. In contrast, the levels of green herbage were similar for all farmlets. Throughout most of the study period, pastures on farmlet A with its higher levels of pasture renovation and soil fertility, had significantly higher DM digestibility for both green and dead herbage components compared with pastures on either of the moderate input systems (B and C). Farmlet A tended to have higher levels of green digestible herbage than either of the other farmlets, which had similar levels, suggesting that pasture renovation and soil fertility had more effect on the supply of quality pasture than did grazing management. This difference was observed in spite of the higher stocking rate supported by farmlet A after treatments took effect. Because of recent technology affordability changes, the satellite imagery only became available AFTER the end of the Cicerone farmlet experiment! Still, it provides some of the most powerful objective data showing changes on the farmlets over time. The Landsat imagery taken before the commencement of the farmlet treatments (June 2000) showed only small differences between the three farmlets, confirming that the allocation of land to the farmlets had been without bias. The assessments using Landsat NDVI in spring over 7 years showed differences in green herbage resulting from the variation in rainfall received over different years as well as differences between the farmlets. The Landsat NDVI images showed increasing and significant differences in pasture greenness over time, especially between Farmlet A and Farmlets B and C. In addition, there were significant differences in pasture spectral classes between Farmlet A and Farmlets B and C, with a significant correlation with higher levels of sown perennial and annual grasses and legumes on Farmlet A. Regular measurements of the feed supply, namely herbage mass and quality, pasture growth and supplement fed and of feed demand were assembled to provide monthly estimates of the balance between feed supply and animal demand of all classes of livestock run on the experiment over its duration of 6.5 years. The significantly greater stocking rate, liveweight and reproductive rate of sheep reached on the higher input system (farmlet A) meant higher levels of ME were required to satisfy the nutritional demands of these animals. Using key livestock management dates and measurements of liveweights, the changes in the energy requirements of each class of animal were calculated and aggregated to provide an estimate of overall livestock energy demand over time. Subtracting the energy demand from the estimated energy supply provided a partial net energy balance. The assessment of liveweights was considered a key component of measuring the integrated effects of the farmlet-scale treatments. Early in the experimental period, there were no significant differences between farmlets in the liveweight of any class of livestock. From the second year onwards, as the pasture renovation, soil fertility and grazing management treatments took effect, differences in liveweight between farmlets became more apparent and significant. The stocking rate, which was treated as an emergent property of each farmlet, reached a maximum annual average value after 5 years of 12.6, 8.5 and 7.7 dry sheep equivalents (dse)/ha on farmlets A, B and C.
The liveweights of ewes, both before joining and during pregnancy, varied with year and farmlet with those on farmlets A and B tending to be significantly heavier than those on farmlet C.
The weights of lambs/weaners/hoggets, both pre- and post-weaning, were at times also higher on farmlets A and B compared with those on farmlet C and were affected by a similar range of factors to those which affected ewe weights. Similar relative differences also applied to the liveweights of the other livestock run on the farmlets, namely wethers and non-reproductive cattle. Stocking rate was able to be increased towards the higher target of farmlet A due to the higher level of pasture renovation and soil fertility on that farmlet, which led to high liveweights per head as well as the higher stocking rate. In contrast, the intensive rotational grazing practised on farmlet C did not allow the farmlet to increase its stocking rate towards its higher target. It appears that the higher proportion of each of farmlets A and B grazed at any one time allowed all classes of livestock to reach higher liveweights per head than on farmlet C, due presumably to the greater proportion of those two farmlets grazed at any one time. Over the first 2 years of the experiment, there were few differences among farmlets in ewe fat scores or reproductive performance. From 2003 onwards, while the percentage of ewes pregnant was similar between farmlets, the average proportion of multiple births (ewes scanned in late July, with twins) was 30%, 16% and 12%, respectively, on farmlets A–C. However, lamb losses were greater on farmlet A, with average lamb mortalities recorded on farmlets A–C of 29%, 10% and 19%, respectively. Over the duration of the experiment, ewes on farmlets A and B were more often above a fat score level of 3, and less often below 2.5, than were ewes from farmlet C.
These farmlet-scale findings highlighted the importance for livestock managers to focus not only on grazing management, stocking rate and stock density during lambing, but also on the availability of sufficient green, and especially legume herbage, and the difficulty of overcoming a deficit in quality herbage with supplementation. As expected, up until 2001, there were no differences in wool production between farmlets, as it was early in the trial. After 2001, significant differences between farmlets emerged in greasy fleece weight per head and price received per kg of fleece wool. 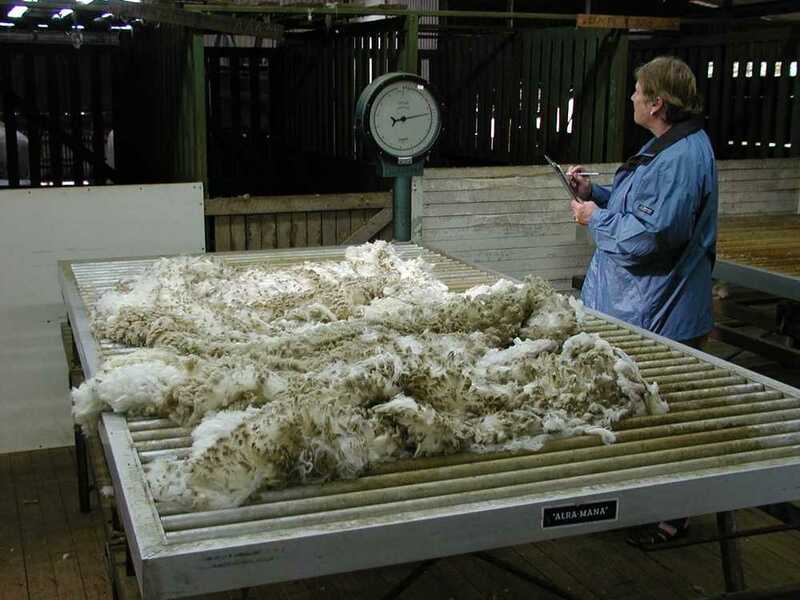 The clean fleece value averaged over the 2003–05 shearings for all hoggets, ewes and wethers was 1531, 1584 and 1713 cents/kg for farmlets A, B and C, respectively. There were small but significant differences between the farmlets in average fibre diameter and staple length but less so with staple strength. Differences in wool income per ha between farmlets grew in later years as the farmlet treatments took effect. The average gross wool income per ha from 2003 to 2005 was $303, $215 and $180 for farmlets A, B and C, respectively. The highest amount of greasy wool produced was in 2004 when 38.2, 26.5 and 21.5 kg/ha was harvested from farmlets A, B and C, respectively. Greasy fleece weight, staple length and staple strength were significantly positively correlated with the proportion of the farm grazed at any one time, and with soil phosphorus, legume herbage and green digestible herbage thus highlighting the significant influence of pasture and soil inputs and of grazing management on wool production and quality. Farmlet C had lower mean faecal worm egg counts (WEC) (444 epg) and annual anthelmintic treatment frequency (3.1 treatments/year) over the whole experimental period than farmlets B (1122 epg, 4.3 treatments/year) or A (1374 epg, 4.7 treatments/year). The main factors influencing WEC were the time since the last anthelmintic treatment, and the anthelmintic used at that treatment. Management factors associated with stocking rate and grazed proportion (proportion of each farmlet grazed at any one time), and climatic indicators of both temperature and moisture availability also had significant effects on WEC. In a region with Haemonchus contortus as the major sheep nematode, improved host nutrition in a higher input system (farmlet A) did not provide more effective control of gastrointestinal nematodes than typical management (farmlet B); however, it was observed that gastrointestinal nematode control was no worse on farmlet A than on farmlet B in spite of farmlet A supporting a 48% higher stocking rate by later in the trial period (2005). The study provided strong support for the proposition that intensive rotational grazing (farmlet C) provides more effective control of gastrointestinal nematodes than typical management (farmlet B) as evidenced by significantly lower WEC counts and anthelmintic treatment frequency. Sheep, wool and beef cattle production have been challenged in recent years by environmental and economic factors and are therefore looking for modified or alternative livestock management systems that are capable of sustaining profitability. Economic analysis needs to report key whole-farm business performance measures since overhead costs can differ significantly between livestock management systems. A representative farm approach was used to compare the profitability of the three different livestock management systems studied on the Cicerone farmlets. The results from the 50 ha farmlets were adjusted up to a commercial scale so that the whole-farm and cash flow analyses would be relevant to farmer members of the Cicerone Project. Because the test period was significantly drier than the average climate, no firm conclusions could be made about which system was more profitable than any other. Nevertheless, it is apparent that whole-farm level budgets are essential for comparing the overall profitability of different livestock management systems. It is concluded that analysts, consultants and graziers should use whole-farm and cash flow analyses to gauge profitability of different livestock management systems particularly where sustainability issues are important. The Cicerone farmlet experiment was conducted over a period of generally below-average rainfall, hence responses to management treatments were limited. A modelling approach was used to estimate profitability over a longer period representing the variable climate of the region. A stochastic discounted cash flow model was developed to estimate economic returns of two of the Cicerone management system treatments scaled up from the farmlet scale (53 ha) to the size of a typical commercial farm in the region (920 ha) over a 20-year period. Several scenarios were used to estimate the commercial-scale returns under different rates of pasture improvement and stocking rates. Over the long-term, Farm A was found to be more profitable but also more risky (in terms of variation around the mean of cumulative discounted cash flow) than the ‘typical’ Farm B management system. If livestock managers choose to adopt a pasture improvement strategy based on renovating pastures and increasing soil fertility, they are more likely to achieve higher net worth with more moderate rates of pasture improvement than those explored on Farm A where a high rate of pasture improvement had been implemented in order to quickly differentiate treatments. This study addresses the problem of balancing the trade-offs between the need for animal production, profit, and the goal of achieving persistence of desirable species within grazing systems. The framework applied in this study takes into account the impact of climate risk and the management of pastures and grazing rules on the botanical composition of the pasture resource, a factor that impacts on livestock production and economic returns over time. Links between inputs, the state of the pasture resource and outputs, are established to identify optimal pasture development strategies. The analysis explored optimum decisions within complex grazing enterprises, over both short-term tactical (such as grazing rest) and long-term strategic (such as pasture renovation) time frames and under climatic uncertainty. The simulation model was parameterised using data and systems from the Cicerone Project farmlet experiment. The strategic decision of pasture renovation should only be considered when pastures are in a severely degraded state, whereas the tactical use of grazing rest or low stocking rates should be considered as the most profitable means of maintaining adequate proportions of desirable species within a pasture sward. Increasing fertiliser costs have significant potential ramifications on the future management of soil fertility and its interaction with the persistence and profitability of sown pastures, especially during periods of climatic uncertainty. A dynamic simulation model allowed the investigation of how the management of soil fertility interacts with the utilisation of pasture resources through different stocking rates. In the application of this method to the Cicerone Project farmlets case study, fertiliser input costs were found to influence the optimal combination of fertiliser inputs and stocking rate. Analyses of the dynamic interaction between fertiliser application and cost, stocking rate and the persistence of desirable species enabled the identification of the most risk-efficient strategies. Woodlots ranging in area from 0.18 to 0.5 ha were established within the Cicerone Project farmlet trial on the Northern Tablelands of New South Wales, Australia, due to a lack of physical protection in most paddocks across the farmlets. Two percent of each farmlet was planted to trees to examine the commercial and environmental potential of seven species to provide shade and shelter for livestock, increase biodiversity or contribute to cash flow through farm forestry diversification. After 5 years, P. radiata (98% survival) and E. nitens (83%) survived best in upslope plots, reaching maximum heights of 7.8 and 8.8 m and exhibiting no or only modest insect damage, respectively. Early frosts in March 2004 were the primary cause of losses in low-lying plots, and frost, waterlogging, insect attack and some inadvertent livestock browsing explain the slower growth of species in low-lying plots compared with their performance upslope. P. radiata and perhaps E. nitens have commercial promise for timber production on Northern Tablelands farms, but only in higher (well drained, less frost-prone) parts of the landscape. E. acaciiformis can withstand the stressful growing conditions in open pasture in low-lying plots, and should be planted more widely for on-farm shade and shelter. E. dalrympleana can also be considered for amenity and biodiversity plantings in lower parts of the landscape. The Cicerone Project was conducted as a Participatory Action Research project, which first surveyed livestock producers to learn of their problems and then carried out investigations according to the Project’s chosen motto of ‘compare – measure – learn – adopt’. This paper describes the extension and education methods and outcomes and reflects on how successful the engagement of livestock producers was through a partnership, which focussed on co-learning by all participants. The results of the two footrot trials led to rapid and substantial changes in the testing regime for virulent footrot, resulting in large savings for livestock producers through more accurate detection of the disease. Other valued extension and industry outcomes were the ability to compare the biophysical and economic performance of different whole farmlets, an appreciation of the value of the whole-farm system approach, the trustworthiness of the results and the stimulation of livestock producers to think more deeply about their management systems, stocking rate and risk. The Project benefited from the research efforts of four postgraduate students and was of benefit to 300 high school and technical college students and also some 500 university undergraduate students who undertook learning projects in conjunction with Project members and collaborators. The present paper provides an integrated overview of the results of the farmlet studies collated from component papers and discusses the inferences that can be drawn from what was a complex, agroecosystem experiment. Although the experiment experienced drier-than-average conditions, marked differences emerged among farmlets over time, due to the effects of treatments. During the latter half of the experimental period (2003–06), farmlet A showed numerous positive and a few negative consequences of the higher rate of pasture renovation and increased soil fertility compared with the other two farmlets. While intensive rotational grazing resulted in superior control of gastrointestinal nematodes and slightly finer wool, this system had few effects on pastures and no positive effects on sheep liveweights, wool production or stocking rate. Whereas farmlet A showed higher gross margins, it had a negative and lower short-term cash position than did farmlets B and C, due largely to the artificially high rate of pasture renovation undertaken on this farmlet during the experiment. Although farmlet B had the highest cash position at the end of the experiment, this came at a cost of the declining quality of its pastures. The main factors responsible for lifting the productivity of farmlet A were the sowing of temperate species and increased soil fertility, which enhanced the amount of legume and increased pasture quality and potential pasture growth. The factor that affected farmlet C most was the low proportion of the farmlet grazed at any one time, with high stock density imposed during grazing, which decreased feed intake quality. The paper concludes that more profitable and sustainable outcomes are most likely to arise from grazing enterprises that are proactively managed towards optimal outcomes by maintaining sufficient desirable perennial grasses with adequate legume content, enhancing soil fertility and employing flexible rotational grazing. This final paper of the Cicerone Special Issue reflects on the entire Project from a wide array of perspectives, including livestock producers, researchers, extension specialists and staff employed by the Project, all of whom are authors of this paper. A notable early successful outcome of the Project was the improved precision of footrot diagnosis, which has been of value to the entire sheep industry. Valuable findings from the whole-farmlet trial included the need for a high quality feed supply for increasing stocking rate and animal liveweights; the ability and utility of satellite imagery to detect changes in pasture growth, composition and recent grazing pressure; the value of short grazing and long rest periods for controlling Barber’s pole worms of sheep; the impact of increased stocking rates on whole-farm profitability and risk; methods of optimising decisions relating to pasture renovation, fertiliser applications and grazing management; and an integrated analysis of all key measured components of the farmlet management systems. By comparing and measuring different whole-farm systems, and by ensuring that producers had ownership of the trial process, the Project successfully delivered objective findings that producers trusted and which increased our understanding of important drivers of complex grazing enterprises under variable climatic conditions. Some of these drivers included: the influence of soil phosphorus on botanical composition and subsequent livestock production, the role of pasture renovation and soil fertility on herbage supply, herbage quality and stocking rate, and the improved gastrointestinal nematode control delivered by intensive rotational grazing. Having livestock producers play a significant leadership role led to valuable outcomes achieved with research collaborators; this should encourage the development of other learning partnerships which aim to explore complex farming system issues.